In fact, today’s nurseries are phasing out those colorful cartoon themes and pastel walls that used to be all the rage. Instead, high design is the theme of the moment, and baby’s room is more sophisticated than ever before. According to industry experts, this shift to high design for nurseries shows no sign of slowing down, which means it’s definitely time to think beyond pastel paint and stuffed animals if you are renovating a room to become a nursery. Keep It Gender Neutral. In many cases, the only thing you know about your baby before birth is the gender, so it’s understandable that parents want to design around it. However, in this new era of sophisticated nursery design, gender references are being toned down. 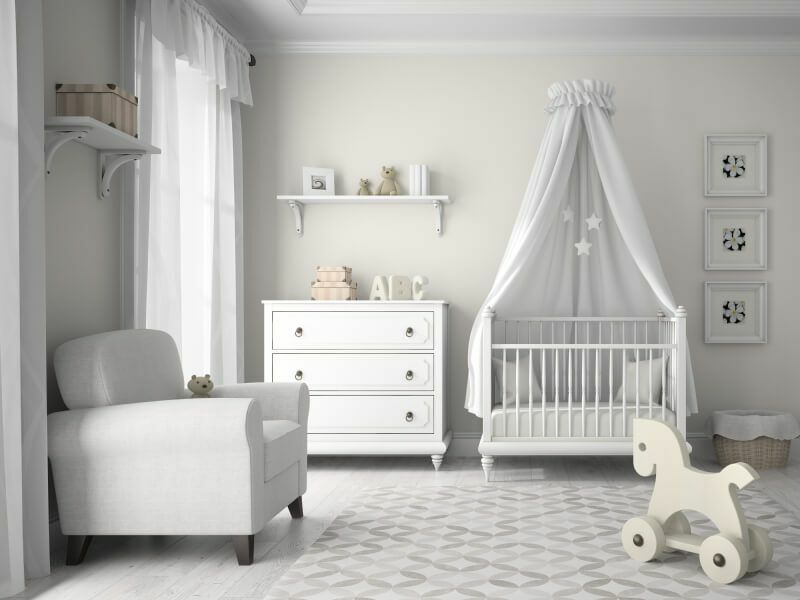 Many people are treating the styling and color choices of today’s nursery like any another room to be decorated in the general style of their home. Sophisticated Color Palettes. Colors like gray, sage green and mocha brown have made their way into baby’s room, replacing traditional pastel pinks, blues, yellows and greens. Designers suggest that homeowners think outside the box when it comes to wall color, incorporating more sophisticated colors, such as teal, plum or maroon, along with stylish, geometric prints and personalized, monogrammed walls. Stylized, Yet Multipurpose Furniture. Today, there are more product options to choose from than ever before. Instead of deciding between a traditional light- or dark-wood crib, parents can now select more distinctive furniture styles, like modern, industrial and midcentury. Keep in mind: In reality, the nursery is not just for the baby – it’s for the parents who want a calming space to care for baby. However, as time goes on, the room is often used for the child the baby grows up to be. Today’s parents are shopping with this multi-purpose mindset, projecting how the room will transition from nursery into toddlerhood, or as a guest bedroom. This is where daybeds to accommodate guests and convertible cribs that can keep up with growing children come in handy. Use these ideas for inspiration and create the nursery of your dreams. Or, contact Republic West Remodeling, a leader in home renovation in Phoenix, for ideas and support for your new baby’s room.